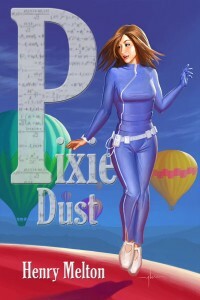 Pixie Dust was actually written earlier than my young adult novels that I began to market under the Small Towns, Big Ideas umbrella, but it shares some of the same ideas. When I re-read the book after letting it sit for several years, I decided that with some changes, I could be happy with it. With more writing experience, I decided that I needed to trim it down a little. I cut out the first chapter or so and deleted a whole section in the middle that I loved, but caused the pace to drag. The main character Jenny, was raised in Amarillo, loved comic books and went to Austin Texas to get her degree in Physics. I was raised in Amarillo, loved comic books and went to Austin to get my degree in Physics. I put her apartment over in the same neighborhood where I lived while going to school. Of course I’m male and 6 feet tall while Jenny was female and tiny, but I wasn’t trying to write an autobiography. The comic book theme was strong in the original version, so by the time I made my changes, I decided to smile and make the most of it. Instead of chapters, the table of contents reads like this: Issue 1 — Origin Story, Issue 2 — I Can Fly!, etc. During the time I wrote the story originally, I was still working at Motorola, but often on weekends, I would take long drives all over the state, particularly into the western areas. The second part of the book, where Jenny was on the run and joined a traveling carnival, was set in a number of those towns I drove through. Research was fun, including visiting a carnival and making interview recordings with people who lived that life. But the most fun I had in the story was the flying, creating the physics problem that Jenny had to solve to keep from losing all her weight, forcing her to build her costume and learning how to use her dwindling weight. Marketing the book has been difficult, since it isn’t quite a YA, and isn’t quite a mystery, and never quite fit any of my categories. However, the cover and the blurb manages to attract readers and it’s one of my top five sellers. So, since I can’t draw, this has been my one chance to do a comic book story — to take a look the whole progression of initial disaster to costumed-hero-saving-the-day — I loved this book and Pixie Dust is my favorite.